Firstly I would just like to get it out of the way this was great, at first i was kind of distanced from the odd characters but the jokes and unique personalities pulled me in so quickly before i knew it i was on the last episode. Main theme of this show would be the male lead pursuing the female lead but development on this is as slow as it comes and the last episode will be kind of what feels like the first big step. So if you can get past the not really progressive love story and have fun with the ride and the character development between the male lead and all of the other characters that are what i have come to believe make this anime great then i highly recommend this to anyone who wants to laugh and i guarantee you will. 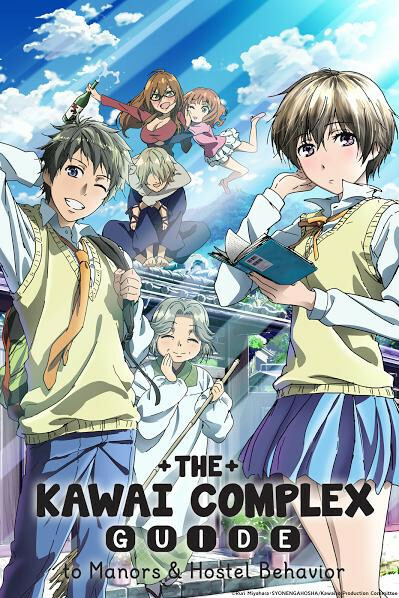 This anime is about an awkward boy who falls for a girl at first sight, but she happens to be incredibly closed off and rather read than get to know other people. It sounds cliche, but the characters surrounding the love story make this very interesting and quite hilarious! I read through The Kawai Complex manga up to chapter 93 which is well beyond what the anime covers. This anime adaptation has lived up to the hype I experienced while reading the manga, and covered most of the chapters minus a few that were excluded. Over all, well done. I just hope they continue making the anime adaptation for it. Truly a great show to watch! Somewhat similar to the Harumi Takahashi's classic "Meson Ikkoku" - a high-school boy living in an old apartment with whole bunch of weird adults, but even more fun! I never have a single episode I couldn't stop laughing. We Japanese may call Ritsu as "a Lotus flower in muddy marsh". No wonder Usa fell in love with her despite his helpless shyness - always being subject of poking from Kawai's weird adult residents, still I cannot help cheer for him. I really enjoyed the main characters. I thought that they were interesting and were a good foil for Usa. However, the story ultimately did not go anywhere, not even a decent conclusion to the "arc". The show was entertaining but I would not watch it again. The first thing to know about this show is that it's a ton of fun and absolutely, gut-bustingly hilarious. The storylines range from very silly to actually serious, but the good news is that no matter how serious things get, you're never far from a laugh. Something I actually really like about this series is how it brings you to care about the characters and the drama in their lives, but still be lighthearted and leave you feeling good at the end of it. That's probably the best thing I can say about this show... It just makes you feel good. The one warning that I would give to people looking to watch this show is not to expect too much in the romance department. On the spectrum of Rom-coms, this show leans far more towards comedy than romance. Certainly, the romance provides the backdrop for the story as a whole, but there's just not enough time in 12 episodes (between all the comedic hijinks) for any serious romantic development. Certainly the romance that is there is nice, and enjoyable to watch, but the main couple never really make it out the blushing glances and almost/not-quite flirting stage. That said, I still have to give this show five stars, just because of how funny it is, and how good it feels to watch. I definitely highly recommend it, just don't expect any kind of resolution to the romance. I was appreciative of the deeper story that was running through the series amid the constant hilarious situations that the anime presented. It was a pretty good balance between serious, character growth, back story and humor. I did think the story dragged now and again, but nothing that made me stop watching. I do see the potential for another season, but doubt it'll be happening. In this great romantic comedy anime the main male character fights against his own awkwardness and the pressures of those who have a hand in his life. I loved to see his daily struggle to not only fit in, but to chase after the desires of his own heart. He never seems to catch a break even with everyone pulling for him in their own way. Makes for a fun watch that lightens your day!